While Bielecki loved to collect records, he didn’t really like to collect base hits. Bielecki is tied for the 10th lowest batting average by a pitcher (min 200 abs) in MLB history. He hit .078. So did Bill Hands and Ben Sheets. Such notables as Aaron Harang (.066), Doug Davis (.071), Clem Labine (.075), and Ryan Dempster (.077) have all been worse. But I want to focus on Loyola College Baltimore – My dad went there, so did Tom Clancy – I love Tom Clancy and am shocked his masterpiece, Without Remorse has not been made into a great Hollywood film yet. I was a philosophy minor in college (to go along with an English with an emphasis in creative writing major – can’t you tell?) and grew found of John Stuart Mill. Working my way through the greatest happiness principle and Bentham and reading Without Remorse, which, essentially, is about a highly trained ex-military person taking out his revenge on a group of drug dealers and pimps – kind of like McNulty. Anyway, it’s an interesting yarn that makes you think about what is and isn’t moral. Oh well, that was a bizarre tangent. The reason Loyola College caught my eye is that, along with Memorial Stadium, my earliest sport memories are of watching soccer games at Loyola. It was always simple and fun. Their stadium was a lot like a high school’s so it was intimate, you could see all the action, kids could misbehave or play on the sidelines and it was cheap and it was in Baltimore. I love Baltimore – it’s just the way it is, kind of why I love the United States. To date, I thought there was only one famous person to graduate from Loyola and now there are two (even if Bielecki gets no billing on Loyola’s wiki page). 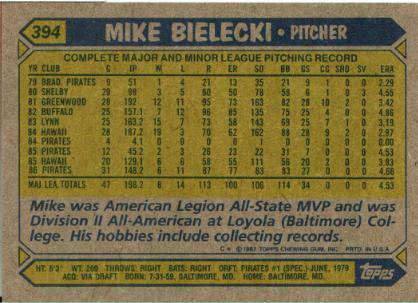 For a guy worth just 6.8 WAR, Bielecki certainly had an interesting 14-season career. 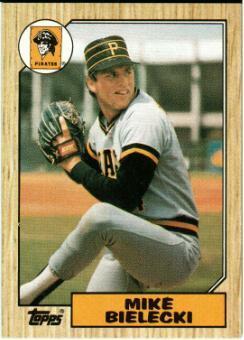 He finished inside the top-10 for Cy Young once (1989). He was worth 4.1 WAR that year (only two other times did he earn over 1 WAR), his sixth season and second with the Cubs. It was a magical season that saw him post an 18-7 record with a 3.14 ERA and 1.26 WHIP. 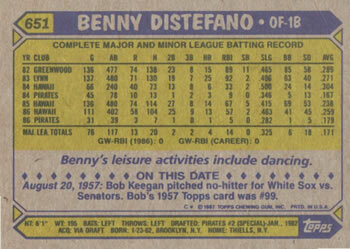 There wasn’t much unique about that year (outside of him topping 200 IPs for the only time in his career), he allowed pretty much the same HR/9 that he always did, ditto for BB/9, K/9; however he somehow allowed far fewer hits per nine innings than he typically did. 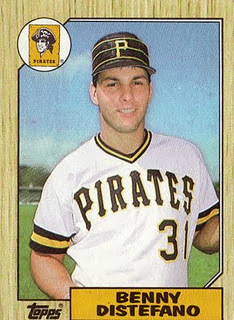 Well, he had a .272 BABip in 1989, which was well below his career line of .291. Outside of his horrendous batting ability and his 1989 season, he was, unfortunately, most known for his connection to Little Lake Nellie. As the story goes, Bielecki was supposed to accompany Steve Olin, Tim Crews and Bob Ojeda on the un-Gilligan-like fateful voyage. The day after the incident occurred, Bielecki was picked up by Jim Thome and Roberto Alomar – yet he was unaware of the tragedy. At that time, I was an avid listener of local sports talk radio (when it existed). I was as glued to the radio that day as I was later during Columbine (and I am by no means equating the two). It was a singular point in my life that I remember vividly – it occurred nine days after my 11th birthday. I had barely heard of the players involved but, by being major leaguers, they were heroes. I’m glad the Bielecki wasn’t on the boat – this would be an even sadder “In Memmoriam”-esque flip side. Instead, hopefully this celebrates Bielecki’s ninth place Cy Young finish, his ineptitude with the bat, and his teammates who met a tragic end.